Ah summers. There you bolt my mood to electric power supply. To hunt for a safe haven, I planned to spend one holiday at a renowned hill spot. The journey began and everything appeared perfect for a delightful day. Slight whistling of wind amidst plenty of tall trees portrayed ideal serenity. I stopped over, parked my vehicle and started to climb a hillock. Virtually at Walden, I was now visualizing the blissful life in nature. Something huge and colourful was partially visible between the pines and I started to move towards that. Gosh… The terrible sight was enough to prick my mental construct of Walden and brutally tow my imagination back to the place of my physical existence in a jiffy. 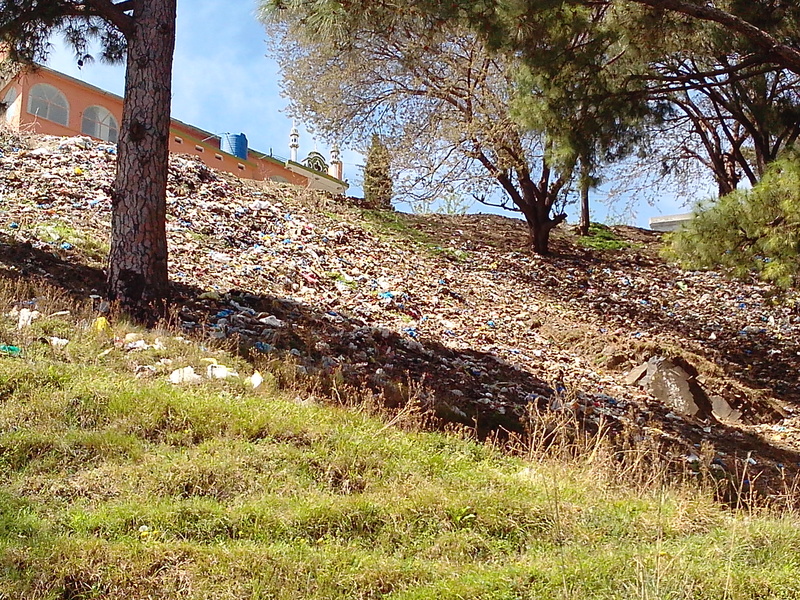 A mammoth heap of garbage flowing down hundreds of yards downhill was lying in front of me. What the hell is that supposed to be? How someone can spoil nature in this magnitude? My eyes traced the ridge line and found a minaret at the top; an abode of worship, a school of being useful and good to others, an epicenter of godliness and may I say cleanliness. I now had a demonstrable answer in front of my eyes as to why common people are pushed away from discoursed holy values and unfaithful flag bearers of religion. Rightly labeled as modern Aunt Sally, the clergy not only lacks the plan to improve but also lacks the will to even make a plan. Perhaps we still don’t understand that society does not love good people, superior ideas and fine values; it only loves whatever delivers to them. Cleanliness is next to Godliness, but unfortunately not even a distant neighbor of a self claimed godly nation on earth, us. In words of Dickens, we tried to find Godliness in the best of times and in the worst of times, in summers of hope and in winters of despair and took our search ahead to passport columns, linguistic dialects, weekly holidays, jobs, organizations, forms of governments, methods of elections, donations and banks… Never did we try to find it in cleanliness of body and soul. Never did we care to look down, peep into our own hearts or smell our own armpits. While being so focused to link every possible human to Godliness, how can we simply forget the prime trait; the lion’s share of faith – Cleanliness of body and soul. Isn’t the Holy Prophet known to have directed not to even visit the mosque with a bad odour? Enough. My picnic was now over. Coming downhill, I just called a friend and asked him to be ready to have my gracious presence earlier than expected. I certainly not wanted to be without power for good period of the day, but I also never wanted to be a witness to this deliberate blasphemy of religious values in serene nature. I revealed the reason of my change in timetable to him, “In Singapore the act of throwing one chewing gum at public place may earn you a fine of 2000 US Dollars besides a punishment for cleaning work at public place. It gives me shudders as to what mess do we live in.” His response to my sentence was a lecture on the ills of the Singaporean society. Presentation of others vices as an alternate to one’s virtues is verified spiritual filth. Full of textual religiosity, fake values and genuine narcissism, our rusted hearts make us blind to our own ills. Isn’t the first logical step for improvement is to admit that there is one better status available than what we are currently at, and that means accepting one’s own weakness with an open heart. Unluckily, if we are made to listen to our own ailments, we only prepare our response during the time the lecture is being delivered. That much for spiritual cleanliness! I was now heading straight home. I had discovered something else that could bolt my mood more securely and pensively in comparison to power outages. Very true and well written. So, what did you do when you saw this scene? Did you make contact with those responsible to ask them to clean up? Volunteer to help them? Or did you just fume and fuss and leave? What difference did you make? I tried to convey my feelings and the message of cleanliness to public. I did not contact any government authority or those responsible for cleanliness. Things dont work any better in this part of the globe unless it is demanded vigorously by the public, even if it is a question of human security, what to talk of cleanliness. and why i believe that going to government officials dont work is that i have an amazing way of predicting the future, from the past.